The Spain La Primitiva is played two times a week - Thursdays and Saturdays at 9:30pm Spain time. It was originally started in 1763 by the Marquis of Esquilache and it is considered as one of the oldest lotteries in the world. La Primitiva has “Reintegro” feature wherein “Reintegro” number is randomly assigned to the ticket upon purchase. Tickets with matching “Reintegro” number will receive €1.00 per line played. When the ticket with matching “Reintegro” number has 5 lines played then the ticket will win €5.00. In order to win the jackpot, you need to match all 6 numbers. During the draw, a complementary number is drawn, which is significant for 3rd prize category only. The jackpot prize starts at €3 million. The largest La Primitiva jackpot to date stands at €66.6 million and it was won by a single ticket holder on 03 August 2013. Choose 6 numbers from 1 to 49. You can also use our “Lucky Pick” random number generator to choose for you. Click “Add Another Line” to play additional lines. You can play 1 to 30 lines per ticket. Play additional tickets thereafter. Choose your draw days. You can play for either Thursday or Saturday draw or play for both draw days. Choose your playing weeks. You can play for the upcoming draw or choose to play for multiple future draws. Note: On purchase of official ticket, the system will automatically choose 1 number from 0 to 9 called “Reintegro”. Once you have successfully placed an order with us, you will receive your OneLotto official ticket(s), which can then be viewed within your “My Account“ page. Once the official draw has taken place and the prize breakdown has been announced, OneLotto will publish and upload the results onto our website. Participating players will also receive a full result email from us. Winning the jackpot plus matching the “Reintegro” number in one ticket is possible. 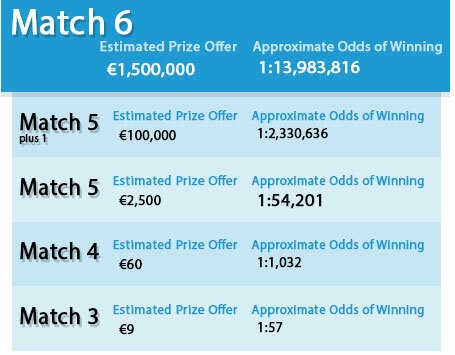 The jackpot prize starts at €3 million and rolls over to the following draw when no winner matches the winning jackpot numbers.